Since the debut album in 2008, Promise and the Monster have both refined it’s acoustic and atmospheric music and earned a really nice CV. Examples are a tour with José Gonzalez, being signed by Cocteau Twins’ label Bella Union, and Wall Street Journal putting 2016’s “Feed the Fire” on the best-of-the-year-list. Also, when Mikael Åkerfeldt of Opeth was the curator of the Dutch Roadburn Festival of 2014, he hand picked Promise and the Monster alongside names like Magma, Comus, Candlemass, Änglagård, Goblin and Trettioåriga Kriget. The year before, they performed on the final edition of Melloboat which also featured Opeth, Änglagård, Trettioåriga Kriget, and others. However, regardless of these merits, it’s the music that should be in focus, cinematic and disturbing, mixing influences from Morricone western film scores, Lee Hazlewood, The Zombies and José Gonzalez. Acoustic guitar arpeggios and haunting, dreamlike vocals are recurring elements of Billie’s music, but in order to get the right atmosphere, horns, violins or horse clopping sounds can be used. 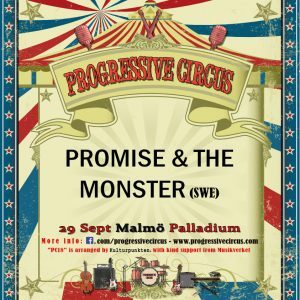 At PC18, you will get the full Promise and the Monster experience, with Bille Lindahl on vocals/acoustic guitar, Lisa Isaksson (who is also in Me and my Kites) on keyboard/vocals, Hanna Andersson on vocals/violin and Love Martinsen on drums/electric guitar.